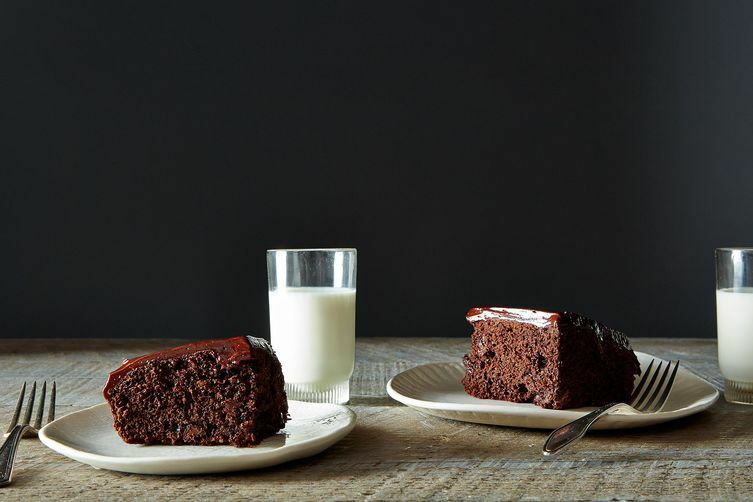 Today: What makes one chocolate cake better than another? Chocolate chips and chocolate frosting. I’m a sigher. I sigh a lot, and I sigh loudly. I call unwanted attention to myself with my deep inhales and gale-strength exhales. I disrupt people in library-like settings. So, when this cake column was born and I realized that I was all but legally obligated to feature a chocolate cake, I left no breath inaudible. Chocolate cake makes me tired -- something about the combination of monotony and richness. Eating a piece is like wading through one of those foam pits at gymnastic centers: Fun fades into exhaustion faster than you would expect; a weird chalky texture is not unusual; and you feel the need to brush your teeth and hands immediately afterwards. 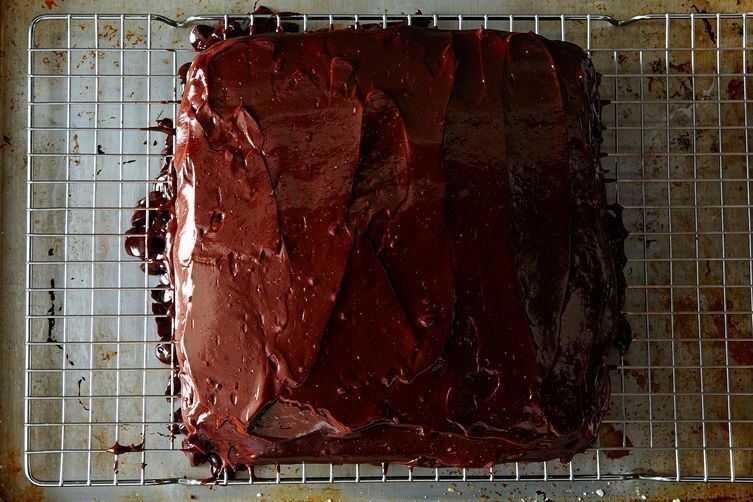 More: 14 chocolate cake recipes to prove me wrong. But chocolate chocolate chip cake (and this one is particular) -- well, that’s a wildly different story. It’s probably the same reason I’d take a Crunch Bar over a classic Hershey’s Milk Chocolate Bar and that I demand raisins in my rice pudding. But it’s more than just textural variation: It’s also that chocolate chips are punctuation marks of solid chocolate in the running sentence that is chocolate cake -- they add rhythm and syntax to an otherwise senseless sound stream. The chocolate chips take care of the monotony issue, and the frosting prevents against overbearing richness (this is one of those counterintuitive, just-trust-me situations). I haven’t tested this theory, but I’d bet a small sum that you’d actually be able to eat more of this cake frosted than you would its naked brother. You’ll find this same frosting on Amanda’s Dump-It Cake. The mixture of sour cream (the scary substance too easily confused with body lotion) and chocolate chips (the manna sent from Heaven above) shouldn’t work, but it does. Don't worry if it's not perfectly smooth -- this is a casual cake. This recipe is slightly adapted from WinneAb’s Chocolate Chocolate Chip Cupcakes with Chocolate Sour Cream Frosting. I use a mix of all-purpose and whole-wheat flour, and I swap out some of the white sugar for brown sugar and maple syrup. A couple tips: First, make sure your sour cream is at room temperature when you mix it with the melted chocolate (otherwise, the chocolate will seize into clumps). Second, if you want to wrap and transport your cake, use toothpicks to construct a sturdy aluminum foil tent. You don't want to end up with a bare cake and heavily frosted foil. HI What a lovely recipe!! My first attempt was almost bitter--I'm now thinking that the culprit was the extra-potent Sampaka red cocoa from Spain. I'll try again with a more moderate cocoa! Has anyone tried substituting plain Greek yogurt for the sour cream? Would that work? I do think that would work! Hi Sarah, can you replace the maple syrup with dark rum? Hi Angelique, I'm not sure that would work since maple syrup has sweetness that rum does not. Thank you Sarah for your response to my question about flour. I shall definitely be making this cake very soon! Bon Appetit! Has anyone tried Agave nectar opposed to the maple syrup? Screw the recipe. I LOVE your writing! Yummmm. Thank you, thesometimescook!! But the recipe is good -- I promise :). I would skip whole wheat flor and replace with pastry flour. Why couldn't cake flor just be used instead of any other flour? You should try replacing the whole-wheat with pastry flour. I think you'll get a cake that's less dense, but I'm sure it will still be delicious. I love your writing - the introduction about your chocolate cake exhaustion was spot on. I made this and it is delicious. OMG. I used bittersweet chocolate chips (Ghirardelli) instead of semisweet and it turned out great. Easy, too. I had whole wheat flour on hand as well as maple syrup and sour cream so no biggie about the ingredients. I used an 8-inch pan and the top cracked but I spackled it with MORE frosting and no one was the wiser. I'm thrilled to hear it!! It's a great cake. I think we need a haiku or two on chocolate cake. "The scary substance too easily confused with body lotion." Two thoughts for you, Hazel: 1. New tumblr idea? 2. That time A.B. ate lotion thinking it was cheese. Can't wait to make this cake! ...how could I ever forget?? While I am staunchly *pro* chocolate cake, in all its forms except dry or nonexistent, I think more chips + more frosting are always good things. I love punctuation! And I love this cake! And I love the words about this cake! I'm going to start a tradition where I copy and paste my favorite line from each of these awesome stories. Here is today's: "It’s also that chocolate chips are punctuation marks of solid chocolate in the running sentence that is chocolate cake -- they add rhythm and syntax to an otherwise senseless sound stream." That seems like a lot of cocoa, especially when compared to the flour. That's what I thought, too -- but it works! The maple syrup adds moisture to prevent against chalkiness. I agree Alvin, it was yummy but very dense and rich. I loved it best warmed up! Everyone who has a recipe on this site seems to over-complicate the ingredients. 1/2 cup of whole wheat flour and 1/4 cup of maple syrup. The whole wheat flour is such an "in" ingredient and maple syrup in a chocolate cake is just silly. You can definitely use all-purpose flour, but I like the heft that the whole-wheat flour adds. You can also just replace the maple syrup with brown sugar, but I found that the cake was much less dry when some of dry sweetener was replaced with a liquid variety. Recipe will work either way, though!